The new TimeCutter® HD zero-turn mower does more than cut grass to perfection. 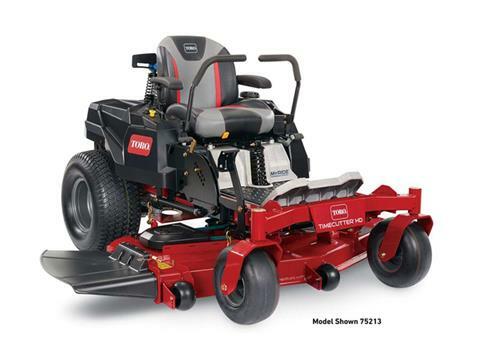 It can also cut your mowing time almost in half*. But when you're bouncing around on rough terrain, speed won't do you any good without superior comfort to match. The smooth MyRIDE® Suspension System features a suspended operator platform that cushions you from bumps and vibrations, so you can be more productive and stay comfortable. Available on select models. And the heavy-duty GRADE 50 high-strength steel deck is nearly 50% stronger than other decks, so you can power through tough grass. You'll not only enjoy mowing - you'll enjoy more free time. Compared to regular 11 - ga. steel decks. 60 in. (152 cm) Fabricated - Grade 50 High Strength 10 gal.